This quick but surprisingly filling dish highlights the delicate flavour of the hare, but it is just as tasty when used for duck or pigeon breast. Hare meat is darker and gamier than rabbit with a distinctive flavour which is more akin to venison. Hare is a treat to eat and should be prepared with care so as not to dry it out. Coat the loin with crushed black and white peppercorns plus a hint of juniper (one or two crushed berries are enough). The peppered loin can be wrapped in cling film and kept in the fridge ready for cooking. Sear the loin briskly in a hot, well oiled frying pan, adding chopped rosemary for flavouring. Seal for two minutes each side. Set to one side to rest. Dress a seasonal salad with a light vinaigrette of peanut oil and white wine vinegar - mixed in a ratio of four-to-one - plus salt and pepper to taste. 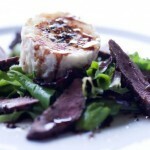 Splash balsamic vinegar over a thick slice of goat’s cheese and sear briefly under the grill. Alternatively, bake the cheese in a warm oven for a couple of minutes to soften, then sear with a blow torch. 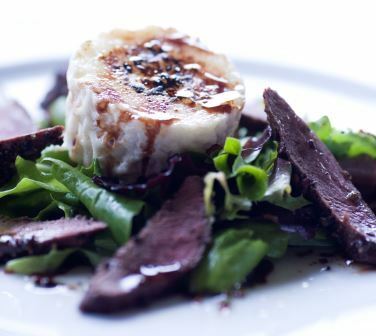 Place the cheese on a bed of the salad, slice the hare loin thinly and lengthways to make the slices as large as possible.